We’re showing you just how easy it is to make everyone’s favorite spaghetti and meatballs from scratch. If you’ve never made homemade spaghetti and meatballs because you thought it was too time consuming, wait ’til you see what I have in store for you. Making spaghetti and meatballs (not from a can or frozen), is in your future and I can’t wait for you to bring this dish to life. You might even give Copycat IKEA Swedish Meatballs a try once you see how easy it is. 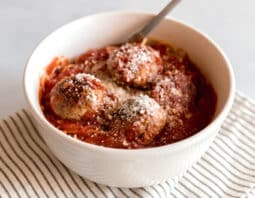 First, be sure to make the BEST, most tender meatballs out there by following our tips on how to make the best meatballs. You’ll get perfect results every time. We guarantee it. Once you form your meatballs, pan fry for about 5 minutes to get a crispy brown exterior. This part adds so much flavor and texture. Then add the spaghetti sauce and let the meatballs cook through the rest of the way. This is a gentle cooking process which keeps the meatballs juicy and tender. Let them simmer for a while and stir occasionally so they don’t scorch to the bottom. Trust me, waiting will be the hardest part as you smell the delicious scent of meatballs and sauce waft through the house, but I promise it will be worth it. Serve over your family’s favorite pasta and don’t forget to top your dish with grated Parmesan cheese! Just don’t add too much Parm… said no one ever. In bowl, combine ground beef and ground pork, breadcrumbs, egg, onion, Parmesan cheese, parsley, Italian seasoning, garlic, salt and pepper. Mix using your hands but don't over mix or it will make the meat tough. Shape the mixture into 1 inch or 1.5 inch balls. In a skillet, heat oil over medium heat. Pan fry the meatballs until they are browned on all sides, about 5 minutes. Add spaghetti sauce to the meatballs. Simmer, uncovered, for 20-30 minutes or until meatballs are no longer pink inside. Serve meatballs over cooked spaghetti and top with grated Parmesan cheese.